Digital Finishing on the Graph Expo Show Floor. New products serve a range of finishing needs..
From September 13 to 16,, 2015, a range of new technologies serving the print space were introduced, demonstrated, and sold off the Graph Expo show floor. 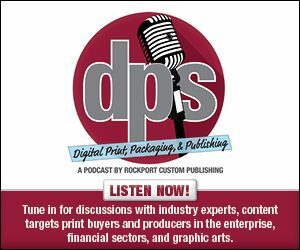 Last week, we outlined key announcements and highlights in the digital print production category. This week, we place the spotlight on finishing. Bell and Howell displayed new products and services that highlight the company’s evolution beyond mail to software and hardware competencies supporting printer sales, wide format print, independent maintenance, robotics, cash management, and smart card production. Bell and Howell’s booth featured a new format that showcased the company’s full array of offerings through multimedia presentations, kiosks, and industry experts. To highlight Bell and Howell’s robotics expertise, the booth featured a working Savioke service robot. The new Producer Package Mailer high-speed inserter for rigid and bubble mailpieces made its debut. This system automates the insertion of documents into clipboard mailers such as FedEx, UPS, and USPS. Kluge demonstrated advancements in die-cutting, laser cutting and scoring, UV coating, foil stamping, and folding and gluing. In the folding and gluing category, the company showcased the new OmniFold 3000 Automatic Folding and Gluing System. The OmniFold 3000 is an integral component of the CartonsInMinutes On Demand Laser Cutting and Converting Solution for the digital workflow of folding cartons. Kluge also introduced the new Kluge UV Roller Coater product line, the newest addition to the Kluge family of products. The Kluge OmniCoat 2000 was demonstrated applying a protective and image enhancing UV coating to various products including digitally printed cartons, embossed paperback book covers, and foil stamped posters. C.P. Bourg showcased its print finishing machines including the Bourg BSF Sheet Feeder in a tandem configuration. Two BSFs connected together automatically switch between units for non-stop finishing of perfect bound books and saddle stitched booklets. The Bourg Tandem BSF was connected offline to the Bourg BM-e Booklet Maker, which applies the latest stitch-fold-trim technology. Additionally, visitors could see the Bourg BSF connected to the Bourg PowerSquare PS224 with PowerSquare P2T Two-Knife Trimmer to simulate near-line production of precision-finished booklets. The company also showcased the Bourg BB3102 PUR-C Perfect Binder with the Bourg BBL Book Loader producing perfect bound books. The company’s equipment was also seen in partner booths including Canon U.S.A., HP, Ricoh, and Xerox. New at the show, Duplo and Ricoh partnered to introduce the 350R In-Line Booklet System, a print and booklet making solution that integrates the Duplo DBM-350/T booklet maker and trimmer with the Ricoh Pro C7100/8100/9100 production printers. The company also demonstrated the new 600i Booklet System, DSF-6000 High-Speed Sheet Feeder, DC-746 Slitter/Cutter/Creaser, UD-300 Die Cutter, and Ultra 200 Pro UV coater. In addition to its current product line, Graphic Whizard unveiled six new machines at Graph Expo, including the PT 335SCC Multi, which is an all-in-one finishing solution, which slits, cuts, creases, and more. The PT 335SCC Multi is capable of creasing, partial perforations in both directions, full bleed slitting/cutting applications, and is efficiently fed by a four-inch deep pile feeder. Also new is the PT 335A Plus Multi Creaser, the PT 520PF pile feeder, the GW 460A PUR perfect binder, and a line of paper cutters all designed to complement growing digital print providers. Harris & Bruno International announced new ExcelCoat options of a Corona Treatment Unit and Duplexer. The Corona Treatment Unit eases wettability for primers/coating over substrates and ink traditionally difficult for adhesion. The ExcelCoat Duplexer flips sheets for seamless inline duplex coating or to prepare prints for the next downstream finishing process. ExcelCoat’s chamber/anilox metering system is the preferred method for applying acqueous, soft touch matte, and other coatings with particulates. Its automatic wash-up and ability to save 50 jobs allows easy repeatability with quick changeovers and minimal downtime. Highcon and key customers showcased the latest technology advancements and production success. Following the success of the Higcon Euclid II series, the company announced the Euclid II S machine, engineered to provide all of the benefits of the existing line compatible with half sheet/29-inch printing format. In addition, with an upgrade option to a full Highcon Euclid II or II+, the new machine enables folding carton converters with large format analog printing equipment to move easily into the digital world. To support its existing and future customer base, the company also demonstrated a new platform to streamline job submission and digital workflows, Highcon Axis. The 2D to 3D platform enables packaging converters to add online ordering capabilities to the services they offer. Higcon collaborated with XMPie and Esko to provide the solution. Martin Yale Industries, LLC announced the acquisition of Count Machinery Company. The acquisition positions Martin Yale to offer a greater variety of product to the print finishing market—from lower volume desktop machines to high-speed floor models. As part of the acquisition, Count’s manufacturing will be relocated to Martin Yale’s facility in Wabash, IN. MGI Digital Technology demonstrated its new digital toner foiling solution, the iFOIL T. The new MGI iFOIL T (Toner), which was demonstrated live in production mode with the MGI Meteor DP8700 S+, is a 100 percent Digital Inline Hot Foiling Solution that seamlessly integrates with the MGI Meteor DP series of production digital presses. For the first time, printers now have an integrated digital and finishing solution to create elegant, eye-catching foiled effects directly on uncoated paper using toner at high production speeds. Graph Expo attendees had the opportunity to see, for the first time, MBO Unwind/Rewind Systems customized for Screen Digital Inkjet Presses at Komori’s booth. Pitney Bowes showcased its new Epic Inserting System. Unveiled earlier this year, the high-speed multi-format solution is designed to cost effectively process complex transactional mail applications with demonstrated integrity and high yield to simplify capacity planning, increase operational productivity, lower total cost of ownership, and improve return on investment. Rhin-O-Tuff introduced a new all-in-one electric coil binding system, the new Coil Binding System 3000. It is a desktop system that combines electric coil punching, inserting, and crimping into a compact modern design ideal for office and small print shop environments. Scodix launched Scodix Foil, an inline digital foiling station for the Scodix Ultra Pro. Using a unique patent foiling process, Scodix digitally produces professional results that match and transcend quality standards of either traditional hot foil or cold foil processes. Scodix Foil efficiently uses readily available foils to produce a range of colors with no waste or mess. And with the addition of the foiling station, Scodix Ultra Pro becomes one of the industry’s most versatile digital enhancement systems, offering Scodix Sense, Scodix Foil, Scodix SPOT, Scodix Braille, Scodix Metallic, and Scodix VDP/VDE—all in one. Occupying one of the largest spaces on the show floor, Standard featured a range of capabilities including die cutting, perfect binding and trimming, creasing and folding, saddlestitching, inspection systems, and roll-fed print solutions. In addition to end-to-end demonstrations, the company unveiled an all-in-one smart sheet processing system from Horizon of Japan, and also debuted a new dynamic perforating and punching module from Hunkeler of Switzerland. The new Hunkeler DP8 Dynamic Perforating and Punching module is part of a Roll-to-Booklet Solution, processing pre-printed rolls into finished booklets with dynamic perforations throughout at speeds of up to 600 feet per minute (fpm). The line also features the Hunkeler UW6 and CS6-I Cutter inline to the Horizon StitchLiner Digital Saddle Stitcher, and equipped with the Hunkeler WI6 AWeb Inspection System. The new Horizon SmartSlitter sheet processing system slits, gutter cuts, edge trims, cross-cuts, perforates, and creases all in one pass. Skip perforation is also available for production T-perfs and L-perfs. Observing its one-year anniversary of operating under its new name, Tecnau announced multiple new products including the TC 1550 HS PLUS dynamic perforator. Based on the established TC 1550 family products, the TC 1550 HS PLUS features a boost in top speed up to 800 fpm and corresponding production in minimum repeat lengths. The TC 1550 PLUS was demonstrated in its booth along with the Stack 2320 cut/stack system, WebVision EXspect quality monitor, and new WebVision PreView remote programming station. The company’s new SheetFeeder KM 2250 was also demonstrated in the Konica Minolta booth. The roll-fed system offers up to 14 hours of non-stop, cutsheet paper feeding to the Konica Minolta bizhub PRESS 2250P Monochrome Digital Production Printer, making booth operators and the printer more productive and potentially reducing paper costs by as much as 30 percent. Tecnau’s Roll 555 also provided unwinding and rewinding for the space-efficient Canon 3000 Z series high-speed commercial inkjet printing system on the show floor in Canon’s booth. Visitors to Therm-O-Type’s booth saw the Zip-TS2L Mark IV digital finishing machine, which offers capabilities including round corner products; inline slit, score, perforate, and semi-slit; cross-perforating; up and down creasing; die cutting; blind embossing; hole punching; and bindery punching. The company also showcased its FT-15 Foil Fuser, a hand-fed fuser designed for limited production applications. Sophisticated finishing enables print providers to be more productive and versatile. From end-to-end automated solutions for book binding and roll-to-sheet options to all-in-one cutting devices, a variety of new and improved options from the show floor are poised to improve productivity and efficiency for every type of print provider.